I’ve personally found that the great misreadings in critical reviews and deep studies on the themes of Blade Runner 2049 and the original 1982 feature from Ridley Scott tend to lie not with the pictures themselves, but in the big questions that they dare to ask. So many think this is a story about discovering truth, deciphering what is real and what’s not, separating fact from fiction. We’re tempted into joining the investigation. But to read these films that way is to undercut the severe ambiguity they both welcome. Blade Runner 2049 might lack the alluring assurance of its predecessor, and is most certainly overlong, yet it finally ponders – and even comes close to answering – the telling questions that have kept every living being awake at night. “Why am I here? What is my purpose?” By capably blurring the lines of people and Replicants (an android so human you can’t tell at first glimpse) more than ever before, 2049 forces us to look inward, and there we challenge the very definition of humanity and the source of soul. Not much has changed in L.A. from 2019 to 2049. Cars still fly, the air still looks like smog, the city itself is visibly dim from overhead shots. The world of Blade Runner is a contradictory one; it’s desolate and regressive and hopeless, yet the inhabitants are more reliant on advanced technology than ever (I suspect this is to serve as an ominous metaphor that tech can’t save us from ourselves). LAPD agent K (Ryan Gosling) is the blade runner of this film, a cop who hunts down and “retires” old Replicants with his gun. At night he returns to his outfitted studio apartment in a decrepit high-rise, chatting and playing house with his hologram lover Joi (Ana de Armas). She even projects a fat strip steak dinner over his bland bowl of presumably rationed protein noodles. K’s life is full of artificial layers, and the film gets more interesting as it peels them back one by one, eventually leaving our protagonist staring truth dead in the eye. It’s not about him objectively questioning reality; it’s about K subjectively understanding the world around him. K is tasked with a mission by Lieutenant Joshi (Robin Wright), he follows through and hides details, bigger plot elements emerge. The less that I say here and the less you read about Blade Runner 2049, the more impactful it will be in theaters. I can still talk about Niander Wallace (Jared Leto) though, a philosophical and blind businessman who’s the godlike figure dealing at the table. His company is less about forging false reality and more about creating such pristine copies that you’re lulled into accepting them as ordinary. He’s in fewer than 5 scenes, and I imagine he’d have worked better as an unseen mythic figure than a controlling and ultimately unknowable entity. His presence and archaic dialogue are unnecessary, entirely because his henchwoman Replicant named Luv (a scene-stealing hurricane of abused slavery from Sylvia Hoeks) embodies his didactic methods through her empty stares and single stream tears. These antagonists share a lot of the same qualities as the Die Hard duo of Hans Gruber and Karl, except in 2049, and much to the film’s benefit, the gravitas is lent to the subordinate. If you’ve watched the trailer – which, if you’re still reading at this point, I’m almost certain you have – then you know that Harrison Ford reprises his role as Deckard. He’s aged well, in hiding for reasons we come to learn, still unsure of himself and those he meets. Ford has been faced with reinvigorating so many of the roles from his hey-day, and every turn has felt reluctant. What’s different in 2049 is that Deckard just feels so much like the Ford we watch in real life; he’s reclusive, shy, and doesn’t want to be found. Hell, he even tries to hunt down K upon first meeting. Perhaps a Blade Runner never unlearns how to shoot and kill instead of stop and frisk. Blade Runner 2049 seemingly takes forever to get to this fateful encounter, treading its path as cautiously as a soldier entering a mine field (I could watch Gosling tiptoe through a futuristic landscape as lush as this one all day). Compared to Scott’s original – a film which I still don’t care for, mostly because it mistakenly embraces theme before establishing character – director Denis Villeneuve has made a droll, languid, and I can only assume intentionally taxing picture. Some of the plot should’ve been edited out, but the crucial components are allowed so much time to simmer and given so much volume to thicken that we’re left with a film that’s rich and hearty and willing to fill a void deep in our gut. While it’s likely considered blasphemy by many to call Scott’s Blade Runner a rather heartless endeavor (any film that requires countless edits to get its point across has done something wrong), I am still awed by its stark vision. Inspired by the bleak future of Metropolis and told as nosily as the masterful noirs The Third Man or M, the original has become a benchmark in science fiction because, in my opinion, its largely lethargic narrative helps to highlight a grim portrait of a future unworthy of being idealized and wished for. Without Blade Runner we likely wouldn’t have much better films like Gattaca, Dark City, or even The Truman Show. And cars most definitely wouldn’t fly like they do in The Fifth Element. Ridley Scott outlined a desolate blueprint and Villeneuve has filled it with all of the things that allow us to imagine it as a home. Either way, we never quite feel welcome, and I’m beginning to think that’s attributed to the general theme in play: existential crisis is as much a character in this world as any face that graces the screen. The same can be said for almost every still frame of this picture. So many films simply use the location of a story as the setting, and rarely do they elaborate on or show the patience to allow for the space and time of a city to play a supporting role. Visually, the original holds up astonishingly well, and 2049 surpasses it as a masterclass in lighting, blocking, color balance, and in effecting performance from behind the lens. If Roger Deakins – one of cinema’s all-time great cinematographers – doesn’t finally win a golden statue for his effort here, then he’ll only be gifted an Academy Award post-mortem in an honorary salute. 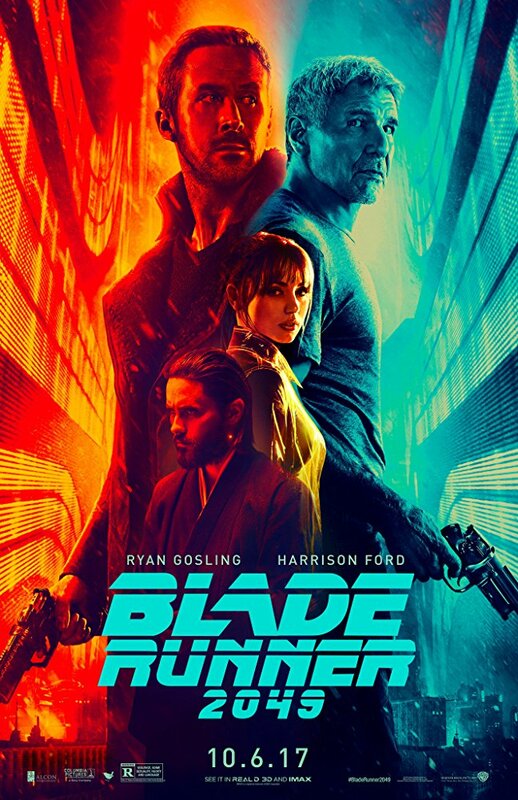 With the direction of Villeneuve, the score from Benjamin Wallfisch and Hans Zimmer (which I actually think is a bit overwrought), and the stellar performances abound, most notably a restrained and quietly passionate Gosling, Blade Runner 2049 brings heart to a cadaver that only formerly had enough room for an overactive brain. Blade Runner might be best known for its poetic ending in the post-theatrical release cuts, with Rutger Hauer’s stage-like delivery of his “Tears in Rain” soliloquy cutting through all of the noise and flat-footed world building to finally end on an emotionally powerful note. It’s one of cinema’s best scenes in one of science fiction’s most-overrated yet influential pictures. Villeneuve’s sequel is better than that. It knows how portentous its script is. It’s more obvious with its visual metaphors yet safer with its overt affection. And it’s more parental in its approach, handling this expanded story with the care of a mother and the harsh reality of a belt-branding father. Blade Runner 2049 coaxes us into existential rebellion by beating us incessantly and caressing us sporadically, falling short of the century’s greatest genre sci-fi movie Children of Men while admirably reaching for the same great heights. Had this film been made at the time of the original, I think i’d feel just as indifferent. However, a futuristic story has finally caught up with the appropriate technology to tell it, and the great debate now shifts towards a conversation as to whether or not progress is necessary anymore. Villenueve’s film is as dark as it is beautiful, and it’s a whimsical interchange between pain and joy that desperately seeks relevancy in a society that’s more drawn to screens than skin. Blade Runner 2049 bravely expands a vague idea into a fully developed conclusion, and even then, ends on mere conjecture. Truly great films don’t need to be watched on a loop; their worth is debated for years on end after they’ve been seen. This is one of those rare movies that earns such a distinction. Is it easy for you to criticize the 1982 original Blade Runner film because you are a child of technology? That film was the first dystopian movie that made me see where the world was heading ….and it did so with no CGI. Maybe no CGI (so they claim), but it still uses the same techniques in practical ways. The miniatures and the effects of the time are so beautiful that they still hold up well enough today. It looks better than any Transformers movie does now. I really just feel the development of character takes a backseat to the bigger and more groundbreaking themes in play. But I’ve also only seen Scott’s Director’s cut of the film, so maybe that’s just me being unfamiliar with the other edits.